Roaring Mama Lion: Co-Sleep, Snuggle, Whatever. Just Love Them. Co-Sleep, Snuggle, Whatever. Just Love Them. How can we keep our kids out of our bed? When will my kids stop sleeping in our bed? I've asked it all, and I've said it all. In reality, I know my kids won't stay in my bed forever. As I've read at least 1,000 times since becoming a mom, "I don't know anyone who's gone to college still sleeping in his mom's bed." My husband may not agree, but he, like. literally, never wakes up when our son comes stumbling into our room, arms full of stuffed animals, voice loud, sleepy, and certain, "I want to sleep in YOUR bed. Mommy, can I come in your bed." The rules have, more or less, flown out the window. I used to aggressively check the clock and walk the boy back, night after night, to his own bed. Shockingly, we both slept better, and more, once I just started walking him to the potty and then back to our bed. He spoons in next to me, his soft hair right under my chin, just at kissable distance, and quickly slips into a deep slumber. Ironically, the earlier he comes into my bed, the better and longer he sleeps. I've started judging the time not by a clock but by how tired I am when he shuffles into our room. Haven't fallen asleep yet? Too early. Wide awake? Gosh, probably a smidge too close to the alarm going off. Can barely open my eyes and am warm and snug? Perfect. Over Thanksgiving, we stayed in a house with not quite enough bedrooms. We wedged a cot in between the wall and my side of the bed. After a confusing first couple of hours, in which the boy insisted that he start on my side of the bed, we went back to our routine. He climbed in sometime in the middle of the night. Because of vacation, because of rain, because of warm covers, we slept in, snug and happy, as late as seven a.m. (oh my!). The return to school on Monday felt rough and brought into clear perspective how much we both value our sleepy time together. I climbed into bed, for twenty or so more minutes of warmth, after prepping for the day - breakfast ready, baby's bottle warmed, lunches in the car. My sleepy son cuddled back in until the alarm sounded. "I don't want to get up. I want to stay here with you." "I know. It's warm and cozy." 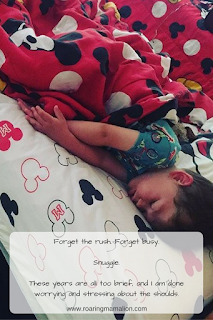 After sneaking out of bed in the morning, I used to squeeze in some of my own work - editing photos, writing, folding laundry...but one morning, months ago, my son called me back into bed. That quickly became part of my normal, something I miss if he gets up too early. My mornings now flow like this - up, shower, prep the day, cuddle some more. I'm much happier. Forget the rush. Forget busy. These years are all too brief, and I am done worrying and stressing about the shoulds. Get under the covers. Stay snuggly and warm. Give lots of hugs. Love them.